HAPPY NEW YEAR to everyone!! I pray that this year will see good health, joy and peace to all of us. 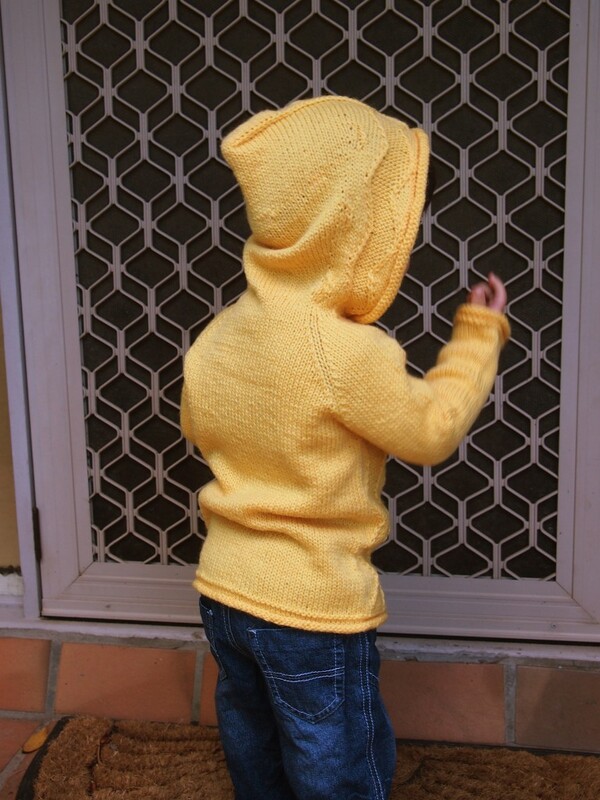 During my long break from knitting in 2011, one of my favorite designers, tiKKi brought a new boy-design out on Ravelry and she named it Ziggy. It is my favorite of all her designs so far! 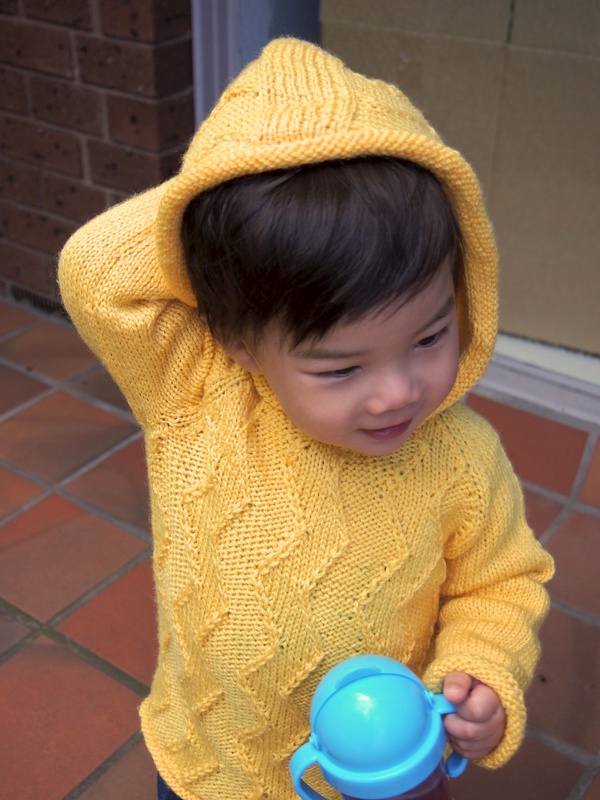 I knew immediately what color I wanted to knit this in for my little Z-man. The trouble was that I needed a washable yarn that was non-acrylic, won’t droop, has good stitch definition, and is suitable for children’s delicate skin. Add to that the color I wanted, and I thought I’d never be able to knit Ziggy. Along came my favorite yarn salesperson – Ruth from Woolsy Trading Post (Geelong), who pointed me to the Heirloom Easycare 8ply color 744. I didn’t want the really bright yellow like the “gold” in the Westcoast Eagles’ colors, but neither did I want the washed out yellow you see in “traditional” baby knitwear. 744 was perfect. It is machine-washable and 100% wool. Due to its crepe-twisted-structure, it IS a tad less smooth/soft to the touch, but it’s not scratchy. 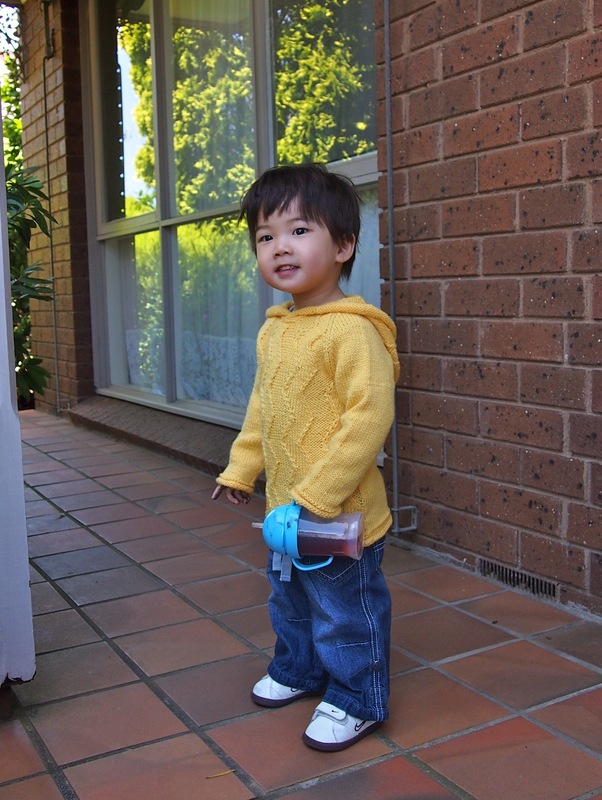 Size: 12months, knit for Z from 18-24mths (due to my loose gauge and Z’s skinny size). 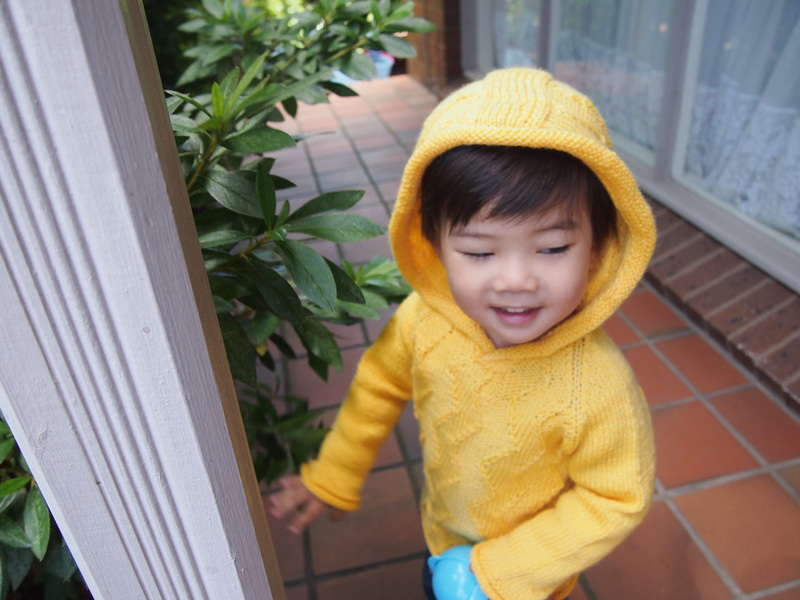 This hoody will last him at least all of 2012 I had in mind a hoody that suited my boy’s personality – his sunny smile, cheerful attitude, and adventurous and cheeky ways. So what do you think? Good to see you back for 2012! I really adore the yellow – I’m loving yellow at the moment too. And Z looks adorable as always. Looking forward to reading more! Thanks for leaving a comment Jho!! As a 34 year old dude, I’m not a crafty cat by any stretch of the stretch, but I do love your blog JCL. It’s so lovely. Will try to read more regularly! Cheerios! Thanks heaps for your lovely comment!! Aaahhhh if only…. It would be a dream come true to own a yarn store, teaching knitting etc.